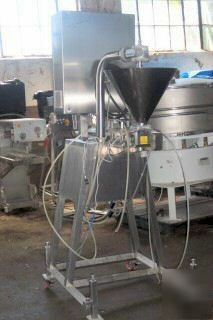 Filler, piston, manufactured by g. Mondini, single head, model VF/SPM-E, all stainless steel construction. Complete with digital controls, 3/60/460v electricals. New in 1997, s/n 1390/97. Unit is portable on casters.